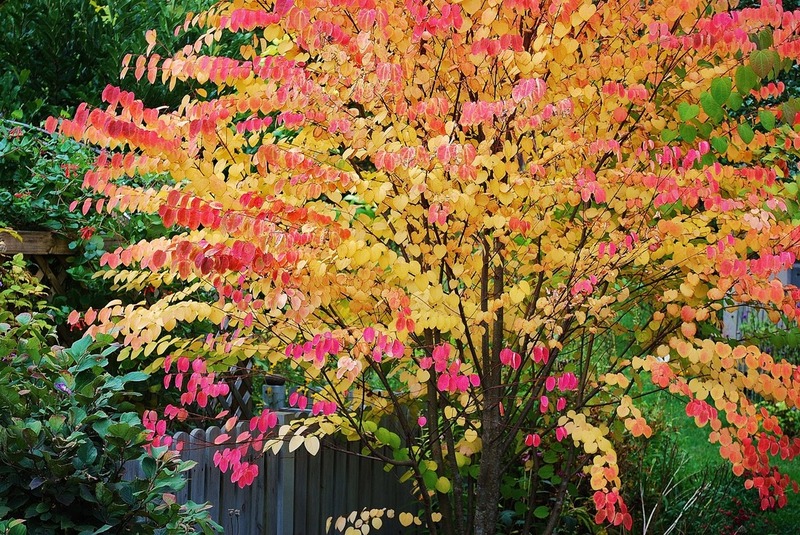 Katsura, or Cercidiphyllum japonicum, is a tree that frequently appears on Connoisseur lists and is just about our favourite tree here on the nursery. It is a refined, long lived tree, deciduous, of medium texture and usually single trunked with a beautiful upright, rounded shape. The flowers are not very showy, nor are the fruits, but the heart shaped foliage more than makes up. The leaves resemble Redbud leaves, hence the name Cercidiphyllum since Redbud is Cercis. In spring the leaves open in shades of pink, salmon, red and purple, then turn green with a bluish cast for summer. But it’s in autumn when the real show takes place. That’s when the leaves turn to rich orange, red and burgundy and these autumnal leaves, once fallen, emit a delicate smell likened to burnt sugar and toffee or candyfloss. Katsura takes sun to part sun and adapts to most soil types. There are no major pests or disease problems and it requires little maintenance other than judicious pruning for shape. It’s an ideal specimen tree that typically matures at 30-50 feet making it suitable for any garden bar the very small. Although native to Japan and China, it does very well throughout the UK, only requiring a little protection from frosty winds as the new leaves emerge in spring.